Eeeee! 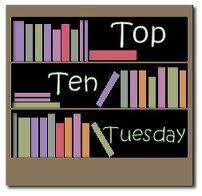 My First Top Ten list, I'm so excited to be posting this!!! There are loads of books I could actually put on this list today. I've read so many books that I just adore, but my problem is I don't read that fast. I really like to take in everything I've read & only seem to do that by reading slowly. This then means I don't really get time to Reread books that I would like too. I need to work on it!! 1. Harry Potter Books - Quite possibly my most enjoyed reads ever. I really did not expect to love them as much as I did. I also love the fandom world that the books introduced me to. I have a lot to thank or even blame these books for. 3. Study Series By Maria V Snyder - I adored this series. Whenever anyone asks for me to recommend books these are first on my list. AMAZING I tell you!! 5. The Hunger Games - These are just epic reads. They seriously get your heart pumping. 8. The Host - There seems to be some stigma now with saying you like Stephenie Meyer books, but her writing re-ignited my love of reading. This book actually made me quite weepy too!! 10. Toms Midnight Garden - I remember reading this a primary school and have somehow forgotten some of what happens, so a revisit would be fab!! We have several books we both love, like "Divergent," "The Hunger Games" and "Harry Potter." I may reread Clockwork Angel really quickly before the follow-up comes out next month. Thanks for explaining your list. So many people just list them.